Rapid and accurate non-destructive evaluation (NDE) techniques are needed to assess the in-place condition of concrete structures. However the time and effort required to perform NDE tests using conventional surface-mounted contact sensors hinder rapid evaluation of full-scale structures. The suitability of surface-guided waves and non-contact sensing techniques to detect the presence of concrete defects is examined here. First, the ability to detect leaky surface waves in concrete with air-coupled sensors is demonstrated. Mechanical surface waves in a concrete slab specimen are generated by a controlled impact source. Next, the data and signal processing needed to improve leaky surface wave data, with respect to eventual application to velocity and attenuation images, are demonstrated. Finally corrected velocity and wave attenuation data collected from a concrete slab specimen that exhibits surface cracking are presented. The images data are then interpreted with regard to sensitivity to the cracking. to evaluate the practicality of using leaky surface wave data for velocity and attenuation measurements to identify surface defects in concrete. The results of experimental tests are reported here. The experiments were carried out at the Newmark Laboratory at the University of Illinois at Urbana. Fig 1: Experimental test set-up showing microphones and rack mount. The microphones in the photo have a fixed spacing of 40 cm. An instrumented hammer with a load cell at the impacting tip is used to generate the surface waves; the hammer also works as a signal trigger. The hammer applies transient force at a point on the surface with varying force amplitude and force duration ranging from 150 to 200 mseconds. The amplitude and shape of the force function is captured and digitized for each impact. The typical signal frequency range generated by the hammer is 0-10 kHz. Highly directional microphones are used as air-coupled sensors to detect leaky waves from the concrete. Direct acoustic waves are also detected and are contained in the signal. The microphone has the following nominal properties: end face diameter = 20 mm; length=386 mm; flat frequency response range 0-20 kHz; output sensitivity = 2.2mV/mbar. The sensitivity of microphone is directional: at an angle 30° from the central detecting axis, attenuation at 6 kHz and 10 kHz are -7.5 dB and -10 dB, respectively. This feature helps to reduce the effect of ambient off-axis noise. In most cases, three microphones were used to collect data simultaneously. The microphones were mounted in line using a mounting system that allows accurate placement of the sensors with regard to sensor separation and sensor height from the test surface. A photo of the multiple-sensor frame in use is shown in Figure 1. The sensor frame maintains a constant microphone height and separation distance. In this case three microphones were used with 40 cm specimen spacing between each and 67 cm height from the test surface. The impact source (hammer blow: hammer not shown in picture) is applied at a surface point along the line defined by the three aligned microphones, but not between any of the microphones. The propagating leaky waves generated by the source are detected by the microphones and are sent to separate channels of a digital oscilloscope. Each transient signal is collected for a duration of 5 ms, and digitized with 8192 4096 points at a sampling resolution 1.2 ms. The digitized data are transferred to a computer using the GPIB interface system for storage and further analysis. Fig 2: Non-contact surface wave detection scheme using an air-coupled transducer. for thin slab and plate structures, the detected leaky waves propagate as dispersive Lamb waves and for thick structures as Rayleigh waves. Wave data must be reliable and repeatable in order to effectively apply those data in images. Signal shape should be consistent in order to measure leaky wave velocity between any two microphone locations since the arrival time of a noted signal feature (usually the highest peak) is used. Signal amplitude should be consistent in order to measure leaky wave signal attenuation between any two microphone locations since the amplitude of a certain part of the signal (again usually the highest peak) is used. However the received leaky wave signals usually contain high variability, especially with regard to signal amplitude, that will disrupt the interpretation. 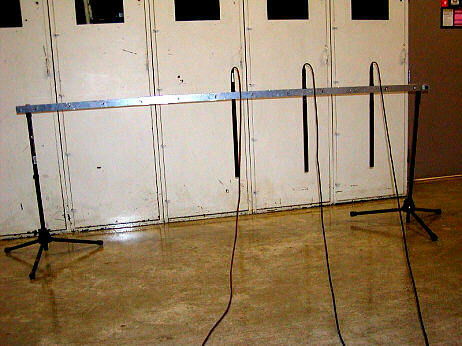 To illustrate this, five separate leaky wave signal separate sets are collected from the same location using the three-microphone setup on a concrete slab. A hammer blow was used to generate the data for each signal set, and the transient force function for each was also collected. The spacing between the impact source and the nearest microphone (microphone 1) is 80 cm. One would expect the force function amplitudes to be consistent among the repeated and nominally identical data. However, the force functions showed notable variability in force duration and amplitude, despite the fact that we attempted to apply consistent blows. Thus the amplitude of the received leaky surface wave generated by the impact (which is used in the computation of signal attenuation) also varies. This variability is illustrated in Figure 3a, which shows the received leaky wave amplitudes of the five repeated signals. The effect of varying force amplitude is obvious: higher force amplitude results in higher leaky wave amplitudes. Here we assume a linear relation between the two, so the leaky wave amplitude can be normalized with respect to the transient force function amplitude since it is known (measured). The variability of the leaky wave amplitude data reduces when normalized with respect to the force function amplitude, as shown in Figure 3b. The duration of the force function also affects the leaky wave amplitude, even if the force amplitude is held constant: short force function duration leads to higher received leaky wave amplitude. This effect is illustrated by the observed relation between applied force duration and measured leaky wave amplitude, as shown in Figure 4. The relation is well characterized by the firt power function relation. This relation can be used to compensate the leaky wave amplitude for varying force durations. The effect of correcting for the duration using the relation obtained fromshown in Figure 4 is shown in Figure 3c. Thus the inherent variability of signal amplitudes can be significantly reduced by corrections for force function amplitude and duration. Fig 3: Variability of repeated received leaky wave amplitude data: (a) raw data, (b) force amplitude correction and (c) force amplitude and duration correction. Fig 4: Effect of forcing function duration on leaky wave amplitude. An existing concrete floor slab was identified for testing. This slab has some regions that are apparently defect-free and other regions that contain individual tightly-closed surface cracks. The approximate depth of the slab is 200 mm, as determined by the impact-echo method. The surface of the concrete is smooth-finished., but Nno extra treatment or preparation was applied to the surface, and . Tthe leaky wave tests were carried out in ambient acoustic noise conditions. Three in-line sensors microphones were used simultaneously to collect data from a single impact event. Each of theThe sensorsmicrophones was were separated by a distance of 40 cm, while the impact source and nearest microphone (#1) were separated by 80 cm. The instrumented hammer with a load cell at the impacting tip is used to generate the surface waves and also works as a signal trigger. A series of 32 parallel linear data sets were collected, with 10 cm spacing between each data set. For each data set, the forcing function signal and three leaky wave signals were collected. Each resulting leaky waves wave signal was corrected for forcing function amplitude and duration. A map of the floor slab specimen, showing crack locations, microphone and impact positions and scan lines is shown in Figure 5. This scan configuration provides paths with no cracking between microphones #1 and #3 (scan lines 1 to 5), cracking only between #1 and #2 (scan lines 27 to 32), cracking only between #2and #3 (scan lines 5 to 10 and 13 to 22) and cracking among several regions (all other scan lines). In Figure 6, correctedthe leaky wave amplitude data are plotted for scan lines 10 to 32 to illustrate effect on the signals of two basic cracking cases: cracks between microphones #1 and #2 and between #2 and #3 respectivelys are plotted across a range of scan lines. In the figure the difference in leaky wave amplitude between signals from two successive microphones is plotted. The scan line regions of noted cracking are marked with checked boxes in the figure. Regions containing cracks that are oriented horizontalperpendicular to the scan path exhibit higher signal amplitude difference. We can establish a signal difference value of 0.15 V as an appropriate decision boundary between cracked and uncracked regions. However, cracks that are oriented parallel to the scan path (scan lines 10-13 between microphones #1 and #2) do not show an increase in amplitude difference. In Figure 7, the leaky wave velocities (computed from the same corrected signals) are plotted across a the full range of scan lines. The leaky wave velocity is determined from the delay in the arrival time of the first large positive peak in the leaky wave signal between two microphone locations with known separation (40 cm). The scan line regions of noted cracking are shown with checked boxes in the figure, the blue checked box designates cracking between microphones #1 and #2 while the green checked box designates cracking between #2 and #3. Regions containing cracks tend to exhibit lower leaky wave velocity. We can establish a velocity value of 2100 m/s as an appropriate decision boundary between cracked and uncracked regions. The velocity (wavefront arrival shape) and amplitude data (color scale) can be combined in a single surface scan image as shown in Figure 98. Fig 5: Concrete floor slab specimen showing impact point and three microphone locations (blue), scan line patterns (horizontal gray lines) and location of tightly-closed surface cracks (red). Fig 6: Amplitude loss (difference) between microphones #1 and #2 (top) and microphones #2 and #3 (bottom) for slab scan lines 10 to 32. The red line indicates a plausible decision line between cracked and uncracked regions. Noted cracked scan line regions denoted by checked boxes. Fig 7: Measured velocity between microphones #1 and #2 (blue) and microphones #2 and #3 (green) for slab scan lines 1 to 32. The red line indicates a plausible decision line between cracked and uncracked regions. Noted cracked scan line regions denoted by blue and green checked boxes. 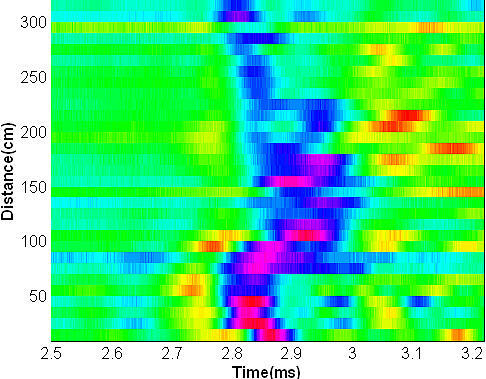 Fig 8: Surface scan image, data from microphone #3 from the cracked concrete floor. In order to make use of leaky surface wave signals for velocity or attenuation imaging of concrete structures, the signals must be reliable and consistent. Signal corrections with respect to forcing function amplitude and duration reduce the variability of the signals, allowing more ready applicationconfidence in the data to interpret for in-place damage. Corrected signals show promise in detecting surface defects in concrete using both velocity and amplitude analysis: signal amplitude difference above a certain threshold and surface wave velocity below another threshold value can act to serve as indications of the presence of damage within the inspected region. Thus, these values are likely candidates as inputs for large-scale imaging schemes, such as computed tomography. This paper was prepared in the course of research sponsored by the National Science Foundation under grant number 0223819. Achenbach, J.D. (1973), Wave Propagation in Elastic Solids, North-Holland Press, Amsterdam. Buyukozturk, O. (1998),"Imaging of concrete structures," NDT & E International, 31(4), 233-243. Pla-Rucki, G.F. and Eberhard, M.O., (1995), "Imaging of reinforced concrete: state-of-the-art review," ASCE Journal of Infrastructure Systems, 1(1), 134-141.
of surface waves in concrete using an air-coupled sensor" in Review of Progress in Quantitative Nondestructive Evaluation, 20, American Institute of Physics, Melville, NY.